We get asked a lot of questions relating to what should be considered when creating the ultimate custom engagement ring. We decided to put together some information to assist in your quest. The First thing to discuss are the various terms jewellers use to discuss a ring. To the left is a diagram describing the various parts of an engagement ring. Next thing to consider is the type of metal you are going to use. We will go into this in more detail in a further post, but here are the basics. Platinum is a pure white alloy that will never yellow. However, it has a more greyish undertone and this will show after time. It is also harder to remove scratches or pits from platinum. Gold is always a great option. 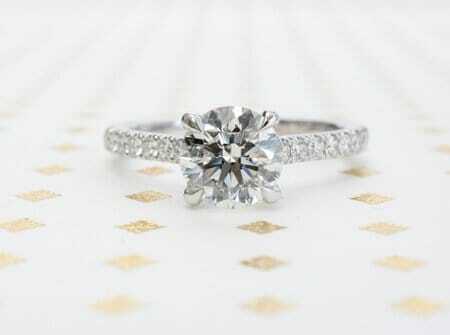 With white gold, we suggest making sure there is no nickel mixed into the alloy as many women are allergic to nickel. We are noticing a lot more yellow gold requests. Yellow gold is an excellent choice as well. The higher the karat, the richer the yellow will look. For a lighter more subtle yellow, go with 14K. Rose gold should be made in 14K. There is more room for copper to give the ring a nice rosy look. Each jeweller will have a slightly different mixture, so make sure they are using quality alloys. Style is an important consideration. This can vary from the more traditional, antique or vintage ring to a more contemporary style. This comes down to whether or not you are looking for a more ornate and intricate design or something simple and sleek. Or, something in between. Its good to view a lot of different designers in order to get a good feel for what it is that you like. The more you can see, the more ideas you will have. 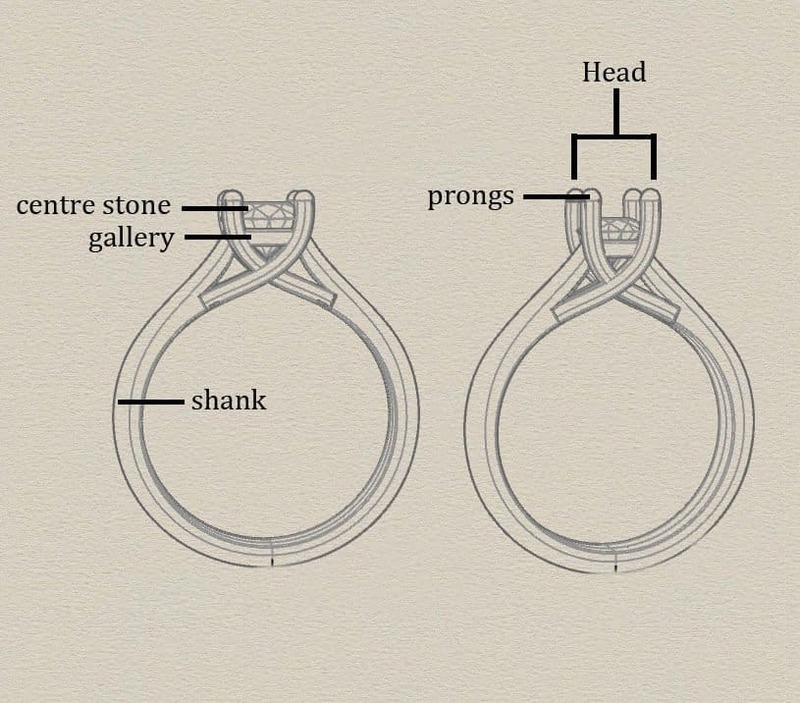 There are many options for the shank of the ring. Starting with the width. We can make the ring wider or narrower and higher or lower. As well, we can make both the outside and inside of the ring curved, slightly rounded or flat. There are many other options. These are just some of the basics. The inside of the ring can be rounded. This makes the ring more comfortable and easy to wear. It is also possible to make the shank narrower and some points and wider at others creating a more of a graduated look. U set – allows the diamonds to attract more light, as the sides are more exposed. Bright cut – setting is done by hand into the metal creating a thin metal border around the diamonds. Shared Prong – common for eternity bands as there is less metal and more focus on the diamonds. Flush – diamonds are set into the shank to give a flat and uniform look. Channel – small diamonds are set into a channel and metal is gently bent over top the edges to hold the diamonds in place. Bezel – diamonds are surrounded by metal. Adds character and keeps diamonds safe from chips. The three most common ways to display the centre loose diamond in the engagement ring is to set it in either a bezel, four prong or six prong style. The bezel style will protect the diamond better long term from chips, but it also covers a good portion of the edges taking away light and making the diamond look a bit smaller. Four prong style will allow for the most amount of light and six prong will give more of a rounded look. These are all very personal choices and there is no right or wrong answer. It really just comes down to personal style and the desired look you are after. OK! Now that you are up to speed on all of the various things we can do, its time to come and meet us! We are happy to answer any other questions you may have and show you live examples in person. Call or email today to schedule a consultation with us.